Today I’m starting a little clean eating challenge that will last 14 whole days. My record until now is about 4 hours, but 14 days sounds easy, right? I guess not, but I’ll do my best. I need to get in shape and guess why? That’s right, somebody’s going on a vacation and is having a little panic attack. But just a minor one. Not that I wake up in the middle of the night drown in sweat breathing heavily because I dreamed of a whale in a swim suit with my face on it. No. This has never happened to me. And as fun as this sounds, I am really starting to feel the pressure. But starting today I am going to be clean eating all the way. From now on, I will wash all my vegetables and fruits. Just kidding. I never wash anything. I eat pretty clean most of the time, but lately it’s been quite weird. And I started eating half. Half. Like half the time clean – half the time pizza. Although I do not consider pizza unclean. I consider it heavenly. Nothing’s better than a pizza. Aside from eating cleaner than a toilette in a fancy hotel, I will be doing some exercises. I do them mostly anyway, but the last weeks I have not been very persistent – so this is my chance to really step it up before I put my body on display at the beautiful beaches in Spain. 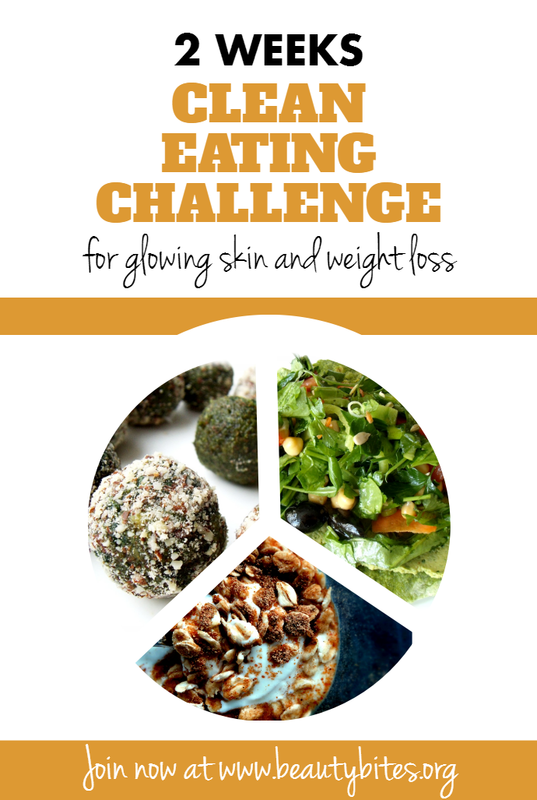 If you’d like you are welcome to join me at this challenge – sharing recipes and ideas. Here’s what I’ve planned. My perfect diet consists of whole foods that provide lots of fiber, antioxidants, anti-inflammatory factors, vitamins, minerals, proteins and healthy fats. This means mostly vegetables, fruits, whole grains, legumes, nuts, seeds and fatty fish. All these foods are of course also good for the skin, as they provide the nutrients and the anti-inflammatory and antioxidant factors for a smoother healthier skin. Avoiding foods is truly not my style, but during these 14 days I really wanna try. After all I want to have the maximum benefits from my clean eating. Besides clean eating means cleaning out the crap out of your diet, right? A little cheese here and there is ok, I can’t live without cheese. Basically I’ll avoid anything that dries out my skin, makes it break out and puts a fat ring around my belly. I don’t really like this question, but I’ll answer it, mkay? Let’s just say I will only eat when I’m really hungry. There’s no real rule to that. Some people say you should eat 4-6 times a day, but it depends on the meal size. The rule that works best for me is: If I don’t feel hungry – I don’t eat yet. Even if it’s breakfast time. I’ll try to have my last meal for the day at least 3-4 hours before going to bed. I don’t know how it happens, but when it gets later in the day some monstrous voice in my head tells me to eat many unhealthy stuff. And eat more of them. Even if I’ve mastered my diet during the whole day and ate ONLY healthy stuff. I don’t know whose voice it is – but I hate it, it’s very annoying. Also eating late disturbs sleep, which in turn also makes us fat, cranky and sick. So by deciding here and now, that I won’t eat past 7 (I go to sleep at 10, grandma-style I know!) I will simply not do it and this will solve my biggest problem with overeating crap. Deciding in advance is the key to stop doing something you really want to quit. I’m not a big planner and I never follow plans, especially food plans – there’s always some surprise here and there. But for this challenge I think every day I will include a healthy drink – maybe something like a smoothie, a breakfast bowl or maybe healthy pancakes, some healthy snack like this one for example, a salad and another main meal which I will decide very spontaneously about. Exercise will be daily and will include a daily run, a short yoga flow and strength exercises all in maximum 1 hour, but I’ll try to fit them into less, because time is ticking for everyone, right? As I like to get this all done in the morning before I start doing anything else, now I’m wondering how I’ll spend my evenings without being able to overeat or drink alcohol. I’ll have to find another hobby. Oh! I forgot to tell you, I am now on social media after almost 1,5 years of writing this blog. And it is wild out there. Seriously I am scared. Nevertheless Instagram, Twitter and Pinterest are my favorites, because you get to share many stuff there. It’s almost like when we were children and had these little paper pieces that smelled really good. All the parents said there were drugs in them, but we kids shared them anyway among each other. Quite like social media. I guess we’ll never really grow up. Since 3 days social media has taken over all my life. Seriously. How do people do it? Are you online all the time? How do you guys manage that? See you here and there and stay tuned for countless recipes this week and updates on the challenge.